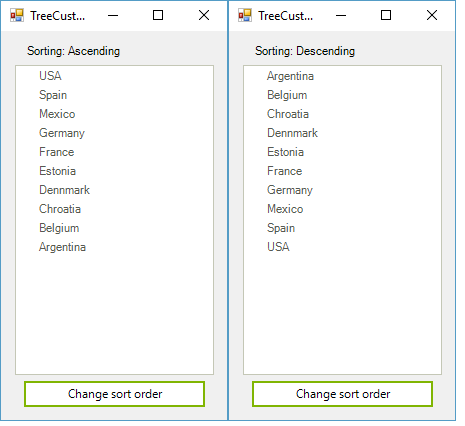 Custom sorting is a flexible mechanism which allows you to replace the default sorting logic with your own logic. The custom sorting operation has higher priority that the default sorting. To apply your own logic for sorting, you have to create a class which inherits from TreeNodeComparer and override its Compare method, where you can add your custom logic. Here is a sample where we will reverse the sorting of the tree i.e. when sorting Ascending we will actually sort in Descending order and vice versa.